Nagi cover strike 2 this week. Synopsis: It's a Fumi and Sharna chapter this week. 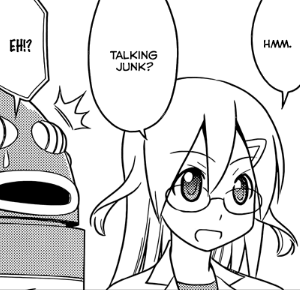 On her path to becoming a "lifesaver" as per the Ikusa chapters, Fumi decides that she needs a robot assistant to help her, which means Hata has probably been watching Big Hero 6... which would not be too surprising given the Godzilla references a few chapters ago just when the film was showing on the big screen. Anyway, they run into Makimura-sensei and Eight who are on their way to Starbucks for some Latte. Fumi asks her to make her a robot assistant just like Eight. After buying her latte, Fumi and Sharna are taken back to Makimura-sensei's lab where she asks Fumi what kind of robot she's thinking of. Fumi says that she wants a robot who can fly and that she can ride on top of. Makimura shows her a fat guy robot, which Fumi instantly rejects. She also says she wants a robot who can do karate chops and roundhouse kicks as a finisher and again, Makimura-sensei says that fat guy robot can do all those. 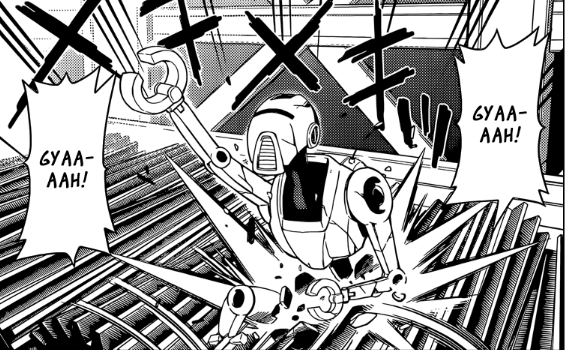 Of course, Fumi refuses to take the fat robot, so Makimura shows her a prototype robot that looks like a Star Wars droid. She says it looks a little plain, so Makimura shows her the female version, which looks like a twin-tailed girl in a bunny suit minus the bunny ears and tail. Umm... is this where I say, "based Makimura-sensei?" Fumi says she's kind of lewd and Makimura adds that she can do lewd things as well. However, she can't fly or do karate chops since she's a girl. She's not quite the robot that Fumi wants, therefore, Makimura says that she'll just scrap her because she runs out of space if she doesn't scrap her creations quickly. After which, she scraps the prototype by crushing it to bits just like that. The lewd-girl robot grabs Fumi's shoulders with a "don't let her scrap me" look on her face, so Fumi reluctantly agrees to take her. More "cute" than "lewd," really, although the two aren't mutually exclusive. The robot doesn't have a name, so Makimura says that she's L-chan for lewd. 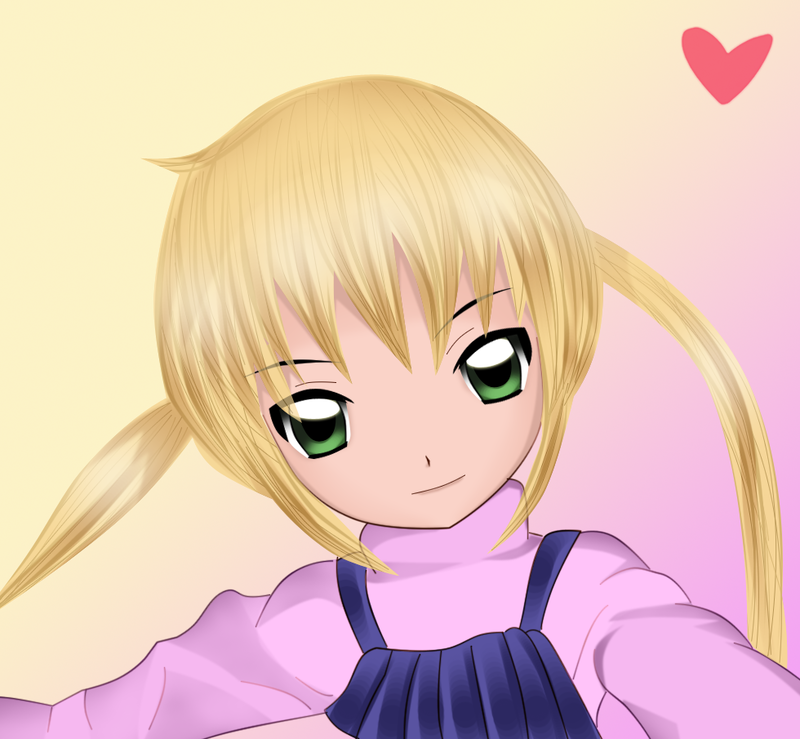 Fumi says that she won't be lewd, but she will call her Elle-chan instead. Outside of Makimura's lab, Fumi asks Elle-chan what she can do and she says that she can eat lots of rice and implies that she's hungry. Fumi whines to Sharna that the robot is trying to extort food from them and Sharna calmly replies that she wanted to be a lifesaver anyway, so there's someone who needs her help right in front of her. Fumi can't argue with Sharna's logic and agrees to get Elle-chan some food -- at that, Elle-chan wastes no time asking for a sea-urchin and salmon roe bowl on sasanshiki rice. Review: Nagi cover is deceptive, but oh well... this was a pretty enjoyable Fumi and Sharna chapter. Flying part aside, I'm pretty sure that Fumi's perfect "care robot" would be Katsura-sensei. I'm pretty sure if you pay her the right amount that she'll Zamnato everything (FFX reference). 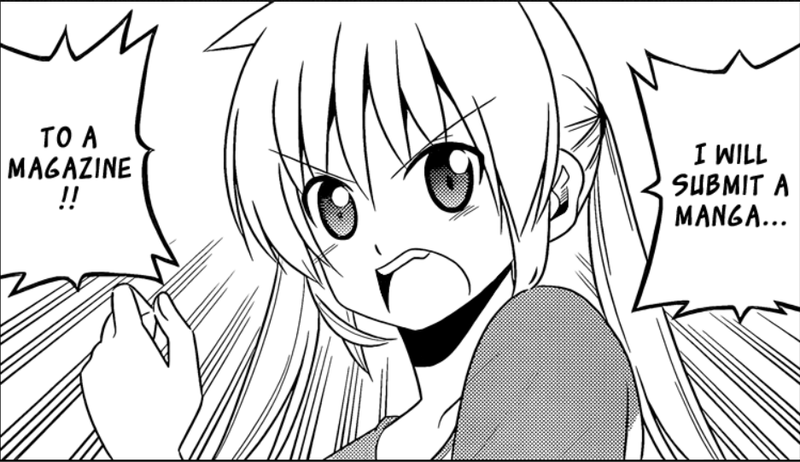 Not much else to say about it, but it does have me wondering if Elle-chan will become a recurring character in this manga given the number of already underused characters that Hata has introduced so far. No fanart nor speculations for this week, but I'll try to make up for it in the succeeding chapters. For now, allow me to repost an old piece... make of it what you will. Nagi covers are the best covers. Synopsis: This week, we check back in with Nagi who is lounging about her mansion and watching Ruka on TV. She reflects on how it hasn't been long since she'd had a doujinshi competition with this idol. Nice to see you again, miss teen idol. Maria chimes in and warns her that she's not taking things seriously enough since they do have a rematch scheduled after ten years and she hasn't actually gained any significant improvement in skill. Kayura also makes an appearance and adds that she only won because Maizumi used his influence and made her manga popular -- in other words, she won out of dumb luck. 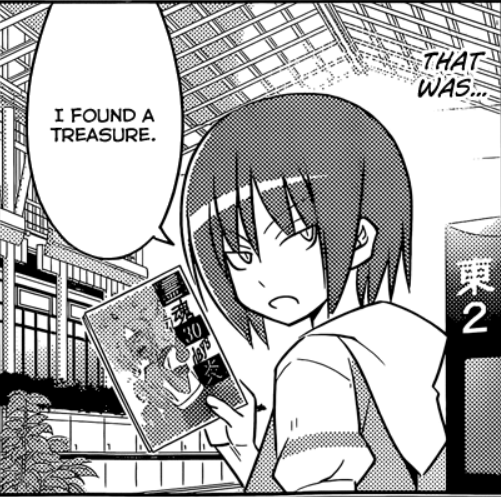 See, I knew Maizumi was a lolicon. 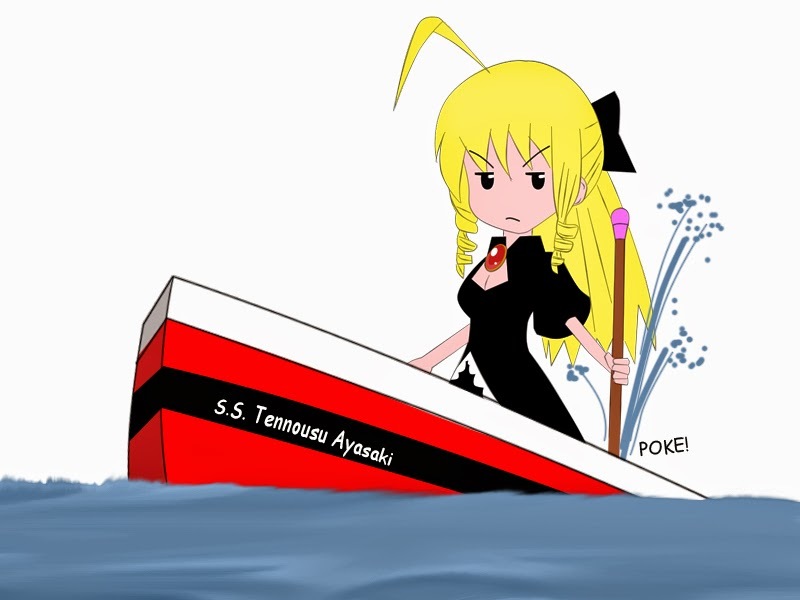 This convinces Nagi to take a new, drastic step in her path towards becoming a true Mangaka. 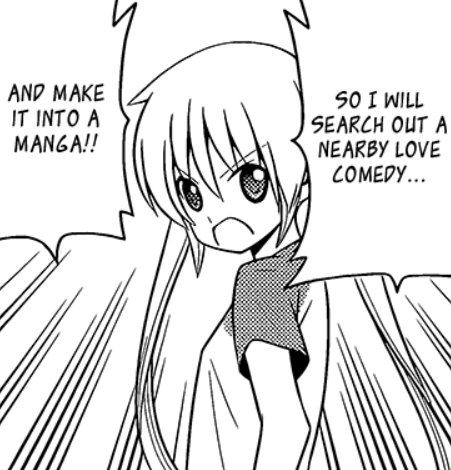 She declares that she would submit a manga to a magazine and possibly win an award. She won't need to look very far. She decides on Shounen Sunday since it's apparently been losing steam lately and they're now taking submissions for new serializations. As for the subject matter, she decides on a love comedy. Having said that she takes a jaded glance at Maria and then quickly drags Kayura down to Wataru's place at Akihabara to search out a love comedy. Once they get there, she shows Wataru to Kayura and reveals her plan to create a love comedy situation by having Kayura confess to him all of a sudden since Kayura is the person least involved in romance that she knows. Kayura is against the idea of a sudden confession, but she doesn't seem to be against getting to know Wataru better. She notices Saki and asks who she is and Nagi explains that she's Wataru's maid. Kayura assumes that he's rich, but Nagi quickly tells her that he's poor. Kayura then declares that Saki must have fallen hard for Wataru if she's staying with him even though he's poor. Nagi is flabbergasted that the thought never crossed her mind before. With that aside, she thinks it would be an even better idea to get Kayura into the mix and turn it into a love triangle. However, Kayura asks her what would happen if the confession actually went well? Nagi thinks that it's impossible, but Kayura shows her an "I love you nyan" moe moe confession, to which Nagi responds that there's not a chance it would work. Review: Okay, so we're taking a break from Hayate and his antics with the new girl, Makise Konoha for now to check back in with Nagi this week. 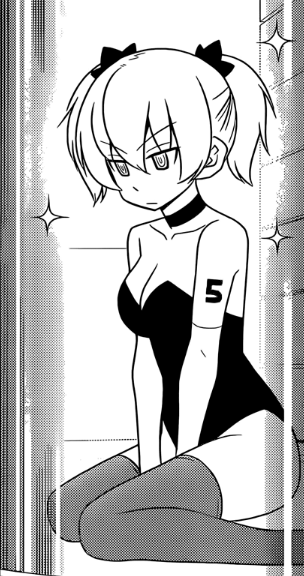 It's great to see Ruka again, even though it was just a short cameo -- although I have to say that there's something off about the way her face was drawn in this chapter. 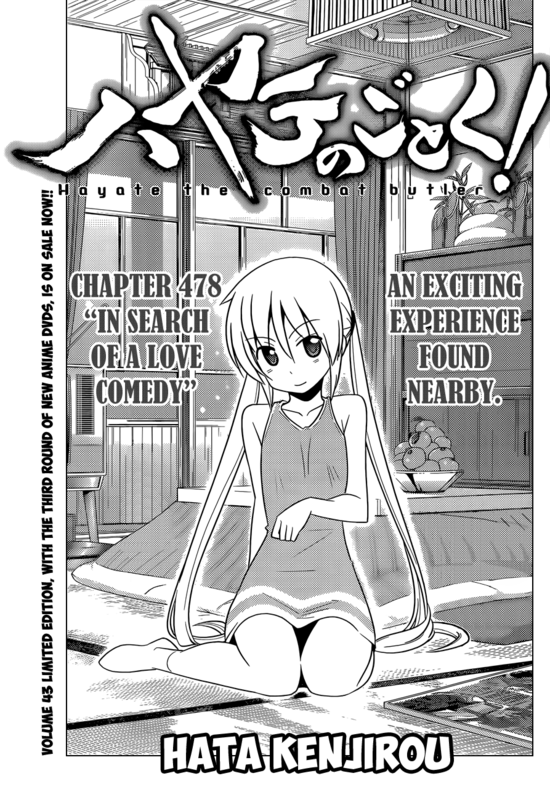 Anyway, looks like Nagi's branching off into a separate mini-arc from Hayate from here on in with Hayate busy trying to resolve his Konoha problems and Nagi busy trying to manually create a love comedy situation and/or otherwise find some inspiration for her magazine submission. More Nagi chapters are always fine by me, of course, but there's not much to be said here. 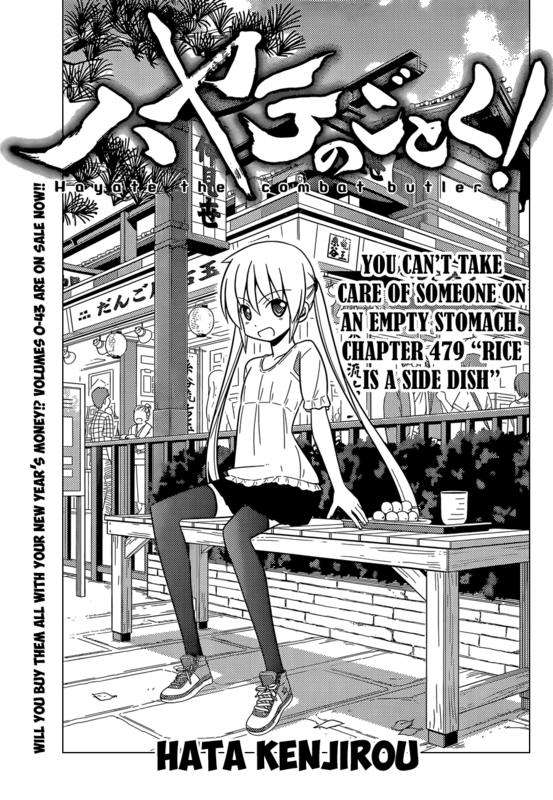 It was a fairly amusing chapter and I've noticed that Nagi is a lot more independent of both Maria and Hayate nowadays since she can just go off to do things on her own or with her Violet Mansion support group... that's a good thing, in my opinion. It's also nice to see that 10-year promise being mentioned here again. We're definitely moving towards a timeskip ending to this manga, I'd say. 1. It could be resolved separately from Hayate's Makise Konoha mini-arc with Ayumu and company and perhaps we'll get some clues along the way as to the bigger, possibly final arc involving Hisui Hatsushiba. 2. 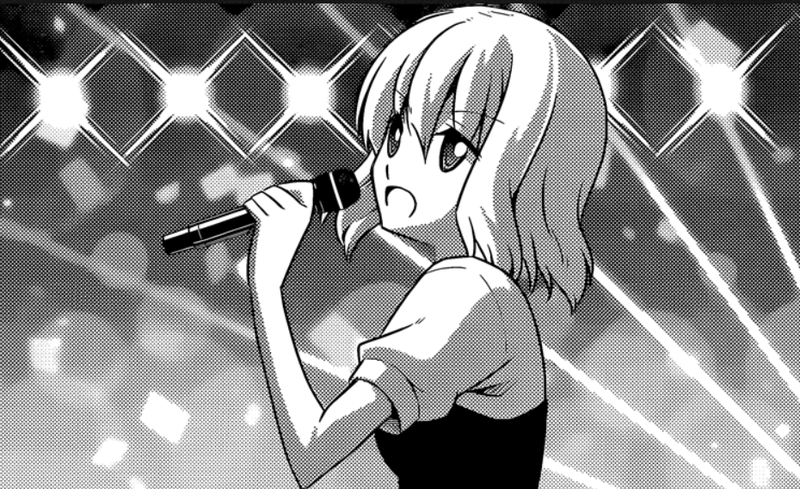 This mini-arc could eventually result in Nagi and Hayate crossing paths at some point (which is probably most likely) given that Wataru and Saki are already in the middle of things and the story could develop into a more serious tone. 3. Hata might dream up something else entirely that I never even considered... very possible considering my track record with these speculations. Fanart Corner: Here we go. For this week, I drew another Nagi fanart. I actually wanted to draw her with more realistic hair with individual strands in this one, so the main focus of this piece was really the hair. I added the little heart at the upper right corner after I'd finished rendering everything just because.